Emmett’s hands, and the new babies. It has been a challenging week with the chickens. Quick update on the survivors: Hope’s doing really well. She’s now sufficiently recovered so as to utterly hate spending time in her “infirmary,” a little cardboard box with food, a hot pad, and medicated water (i.e., water with antibiotics dissolved into it.) She spent the first twenty-four hours in there, but after that had perked up enough to spend nights with her sisters — which helped keep her warm, and also kept her spirits up. Now I only keep her in the infirmary (to drink a little antibiotics, to prevent infection) in the mornings. She’s clearly ready to be done with the hospital: As soon as I walk into the room, she starts cheeping to get out, and the moment I open the roof she flies out of the little box. 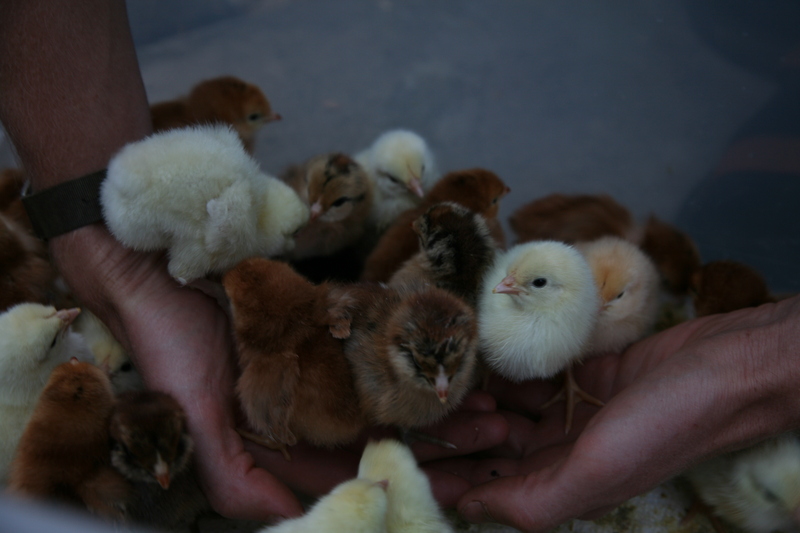 And now, the new chicks. Apparently we got lucky the first time around — absolutely zero problems with any of the chicks (until, of course, the final catastrophe). This time, after the very first night, I found one fluffy little yellow Leghorn dead in the morning. We have NO idea why — I had woken up in the middle of the night, and checked on them: everybody seemed fine, not too huddled together, some sleeping and some eating, as usual. Still, we wondered if maybe the temperature wasn’t 100% right — it was a month later than our last batch, after all, and the ambient air temperature had decreased twenty degrees in that time. Perhaps the lamp wasn’t warm enough to combat that additional cold? So we moved them inside, into their own little room, away from Jasper the cat and in a warm, draft-free spot. I thought that would be enough chicken-trauma for one week. But then, two nights ago, one tiny little bird broke her leg. I’m not sure if it was a stampede that broke her leg, or if her leg was broken beforehand, and that weakened her, causing her to flip on her back — all I know is, all of the chicks were huddled on one end of the brooder (avoiding the scary poop-cleaning hand), and I noticed that one was on her back with her feet up in the air, jammed inbetween all the other chicks. I shooed them away; the little ruddy Rhode Island Red chick got up and limped across the brooder towards me, breaking my heart a little with each pathetic step. Now, in this group of birds, we have two obvious runts. Broke-leg is one; another, who seems to be doing fine, came to us with one side completely… well, pasted. As in, one side of her body was fluffy, and one side wasn’t — like her yolk sac had perhaps ruptured onto her, which would explain both her stuck-together feathers and her small size. That was the one I was worried about. And then this one went and broke her leg. Which means there are two worrisome chicks, and I do not feel like losing anybody else this week! 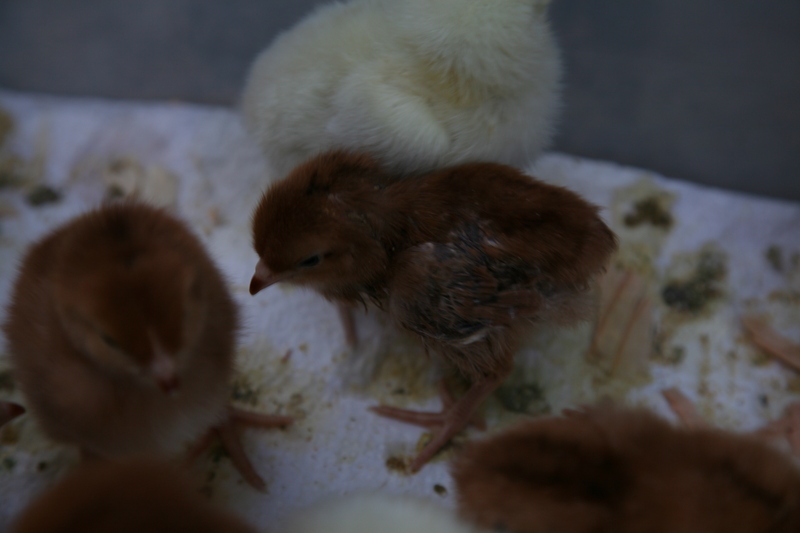 And so it came to pass that we put her in a tissue box, inside the brooder, with bottlecaps for food and water. The water has to be refilled constantly, since the small liquid volume evaporates out fairly quickly beneath the heat lamp’s warm glow. Stumbling into the chick-room at 3 a.m. this morning to refill her water, I felt like the overseer of some strange dollhouse infirmary — how big my fingers seem, and how clumsy when I try to place the water in the bottom of the tissue box without spilling any. The final miniaturized touch: this morning, after finally identifying the location of the break (we think), I held Gimpy upside down while Emmett put a splint on the hurt leg. First, he wrapped an infinitesimally tiny piece of gauze around the leg, so tape wouldn’t stick to it. Then, he placed half a toothpick on either side of the leg, and wrapped medical tape around the gauze/toothpick combo. Finally, we trimmed the toothpick a bit more so that it wouldn’t press into her toes. She can still hobble around with the splint on, but hopefully this will keep some of the pressure off the break so that it can heal more quickly. Below: the “pasty” runt chick, who has gotten a bit better and less pasty-looking each day.